Yesterday was our first Thanksgiving here in our house and our first Thanksgiving with JQ. What a memorable time! He really enjoyed the holiday, even though I don't think he totally got the concept. I tried to explain to him a little bit about it, but most of it was very new. We have been busy preparing for Thanksgiving as well as doing many other things on this homestead. There was also an ice storm yesterday, so we were getting our house ready as well. Even last week, we still had temperatures in the 60s, which is rare for us this late in November. Ice is difficult to navigate, but at least it feels more like the Thanksgiving and Christmas seasons now. We did some small projects related to Thanksgiving, which were a lot of fun. Our thankful tree was made of hand cut outs and my poor attempt to fashion a trunk out of construction paper. It still worked, what does it matter? The kids each traced their hands, cut them out, and then wrote something they are thankful for on each hand. We also made Rice Krispies turkeys, which we have made in the past. For some reason, this year, they were more difficult and they wouldn't stay together. Does it really matter? No. Gather four kids around cookies, Rice Krispies treats, candy corn, and chocolate, and that is all you need. They would eat globs of the stuff just stuck together. Actually, so would I. They sort of looked like turkeys when we were done. What mattered was the time together. Last weekend, we went to a Lego display at a nearby hobby store. Have I mentioned that my kids love Legos? I should mention that. It's not really uncommon anymore--Lego's have grown to be a huge industry again with their themes, the movie, and their wonderlands in various parts of the world. A nearby Lego user group (of grown ups--apparently, you don't really outgrow the love) built a bunch of magnificent displays that were free for the public to view. We weren't the only ones ogling these huge and intricate designs made entirely out of Lego's. A downtown street. Several large models of R2-D2. A U-boat. Our state capitol (!). There was a lot. And there were tons of people there--a lot of kids--because my kids are not the only Lego lovers in town. It was really neat. So now, it is the Christmas season and today is black Friday for some. We don't participate. I don't believe in it. That is all. I could probably get some good deals and save some money now that I have four kids to buy presents for, but it isn't worth it to me. And today in particular, I am sitting by my living room window and it is covered in ice, which has been there since sometime yesterday afternoon. Combine that with trying to drive into the nearby city to battle the crowds....nah. I am just going to get a cup of coffee and sit here. Because I can, and it's good. I'm thankful for that. We certainly have been enjoying this fall. 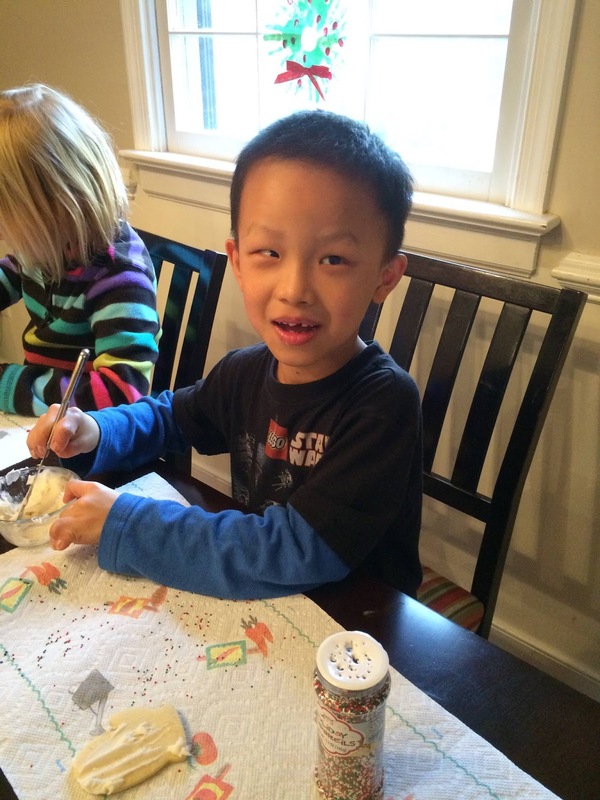 It is our first fall season in our house as well as the first with Jia Qing! It's all kinds of busy, but we love it. Our house, despite us living in it for the past 9 months, still has some areas that are not finished. For instance, we do not have a garage. We decided to do the painting to save some money while building and while the inside is painted, there are areas of trim work that have not been done. We have also not painted the outside and the siding is still primer. We were actually going to do that this fall...we went to China instead. So now, it will have to wait until spring, as will some of the grass that we want to plant, extending the garden, and planting more trees. Yes, some of it has been done. But it always takes a while to get it all done. The kids have been busy in school, although it is a challenge to try and teach 4 different grades at once. I will be honest in saying that I haven't been loving it. It has been so difficult that we switched programs and started using a new curriculum about 3 weeks ago and that is a little bit better. The kids are still learning how to be more independent with school work and since Jia Qing does not know much English, he is starting at the basic levels of vocabulary. However, he is as smart as a whip! Have I said that before? He catches on so easily and he has this drive to keep trying. Russ and I were trying to test some of his math knowledge because we noticed that he is excellent with numbers. He is the age of 2nd grade, but he knew all of his single-digit multiplication tables and was adding and subtracting three-digit numbers. He was so proud when we checked his answers and said, "you're right!" Big smile. Such a kid. Today, the boys are working diligently with some homemade pumpkin play dough. It's actually salt dough colored orange that has pumpkin pie spice in it. It smells so good! But I had to remind them not to eat it. There is a half cup of salt in the recipe. Still, I'm sure if they did, they would quickly learn not to eat it again. This weekend, we visited with family that we have not seen in a while, some of whom have not met JQ. My aunt and uncle each had their 70th birthdays so we celebrated them together with a gathering at my mom's house. There was good food but mostly it was nice to catch up with people and see how they are doing. We had the chance to talk about some family history and genealogy (I love that stuff). My aunt was remarking about how young people (us? young?) often have little interest in history but we seem to love it. I have always loved learning history; my dad was a history teacher for a while, too. I think he instilled a love of that into us, as well as a love of reading because we always had books around. I'm trying to teach that to my own kids, too. So far, it could be working! I know they love history; the reading part is coming along. Asher is getting to be a better reader all the time and it's so great to see him sit down with a book and read it out loud to his sister or his dad, all of his own accord. That's part of our goal here: teaching these kids and instilling in them a sense of the importance of things. Hopefully, it will stick. November has arrived! I always like this month because there is a lot going on. Russ has a birthday in November, Thanksgiving is coming up, and we are winding down to the end of 2015. This year, the weather has still remained warm, and despite some cooler days in October, we have spent the first few days of November with temperatures in the 70s and 80s. I’m not a huge fan of this, as anyone knows…I like cool weather and I’m waiting for my time to bring out the sweaters and hot chocolate! Yesterday was Russ’ birthday. I think of how many birthdays we have celebrated together and how many years I’ve known this wonderful man! We are blessed again to be celebrating and to be thankful for another year together. Since it was Tuesday, it was a normal work/school day. In the evening, we went to Chik-Fil-A for supper. A new branch just opened nearby and we decided to check it out. When JQ lived in the U.S. while he was in the hosting program, the family he stayed with took him to Chik-Fil-A and said that he loved it. We have pictures and videos of him eating there and his excitement over being able to go. I admit that I have been to Chik-Fil-A less than a handful of times. When we were adopting JQ, we knew that he liked the place, but we thought he would just have to learn to like something else around here. It’s possible, right? Then, this summer we learned that a branch of Chik-Fil-A was opening near us! It had some delays but then finally opened last week, just before Halloween. While we did not make it there on opening night, it was still incredibly busy for being open a week, with lines stretching out the front door and no place to sit inside. We still really enjoyed it and will go back and Jia Qing was so very excited! Last year on Russ’ birthday, we were still living in our apartment and had hopes of moving into our house soon. Things have changed so much in the last year. It’s funny how every year when a birthday rolls around, we are amazed at how much life changes—as if it is supposed to stay the same! It’s also exciting to think about what we might be doing a year from now…when we celebrate yet another year of life and living. It is October, the best month of the year, in my mind. I love love love the autumn season with its change in temperatures and saying good-bye to summer. The transition outdoors is so magnificent with the leaves changing; we drive down the road and see farmers harvesting their crops, it gets dark earlier, and the wind is slightly cool. Ah, it is wonderful! Russ and I got married during the month of October, so we celebrated that recently. This year, since we had just come back from China, we were very low-key with anniversary celebrating. 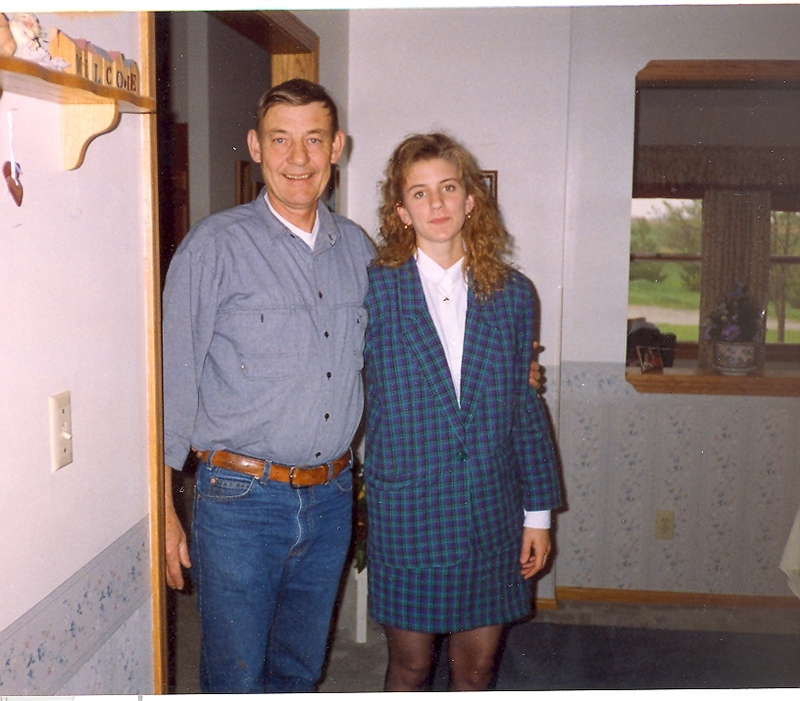 October is also another anniversary of when my dad died. It seems hard to believe, but it has already been two years since he passed away. My dad had leukemia. He lived with it for a year, going through chemotherapy and other treatments for his symptoms while we watched him progressively worsen in health. Actually, though, when he went into the hospital for the last time, I was not thinking that he would not come home. He had to have his gall bladder taken out, which is a pretty common surgery in this day and age. He was scheduled for a laparoscopic procedure, so I wasn’t too worried. But then he developed complications even before going back to surgery. He had a serious infection that spread throughout his body and that eventually caused his organs to fail. He did survive the surgery, but he went to the ICU and passed away a few hours later. I struggled with this a lot; not just because it was my dad lying there, but because I could watch all of the procedures and things going on in the ICU and I knew what was happening and why because I had been in those situations as a nurse before. I struggled with seeing him, even though he was a patient, he was too near and dear to me to be someone who was simply being treated and managed. When he died, he did not slip quietly away after taking a final breath. He went into cardiac arrest and the staff started CPR. I have seen that before; I have been involved in giving CPR numerous times as a nurse. Whether the patient lived or died, there was always one element that was the same: it was always someone else, someone who was a stranger or who was a patient that I only knew for a short time. It was never someone close to me, someone who had known me since before I was born. It was never my dad. Although the rest of my family was there that night, I was the only one who watched them try to resuscitate my dad, which is probably good because it is not a good thing to see. I’ll never forget it. And I struggled so much that night because I was torn between viewing what was happening as a nurse but also as a daughter. And then he was gone. I miss my dad. I think about him every day. I wish he could see the house that we built and I wonder what he would think of it. I wish he could see how Caleb and Asher and Ellie are doing and how big they are getting. One of the last things Dad told me before his surgery was, “tell Caleb not to worry.” He knew Caleb was a worrier and he was right. I wish he could see Caleb now. One thing that sort of blows my mind, too, is that my dad and JQ both were alive for years on this earth, but each never knew about the other. My dad didn’t know that he had another grandchild in China and JQ didn’t know there was a grandfather here for him. I don’t know why the timing turned out that they never met each other or why we adopted Jia Qing after my dad died. I wish they could have met. There are a lot of things I wish for and at the risk of sounding depressing, I will say that I can’t change much of any of them. That is how it is. So, instead, I will just speak kindly about my dad and remember him well. I will sit through the quiet ache that sometimes tears at my heart when I remember him or see his picture. I can still hear what his voice sounds like. I won’t forget him. Like the change in seasons that comes with October, there is always something new here, too. The best thing is to go on and live life well with what is here now. I lost my dad and I gained a son. Wow, have the days been flying by around here! We have been home for 10 days and what a whirlwind it has been. In some ways, it feels as if we never left and China was so long ago. Sometimes, I look at JQ and I see him interacting with our family and it feels as if he has been here all along, rather than just meeting our family less than a month ago. 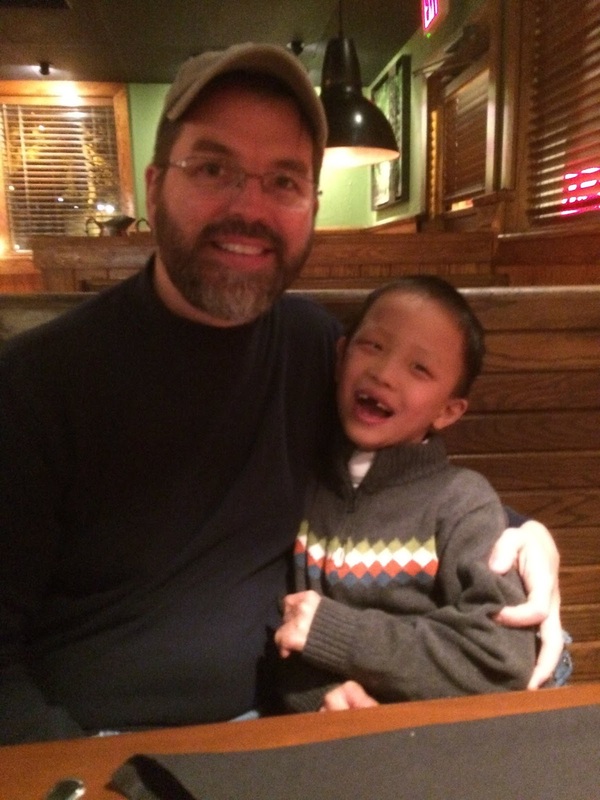 We have been busy with school, getting back into activities, and meeting with relatives so that they can meet JQ. The first week, we only went to about half of the extracurricular activities that the kids do…there wasn’t time or energy to hit everything again. This week, we’ll get back into everything else and return to gymnastics, AWANA, and Cub Scouts. This weekend, JQ met Russ’ parents and sister when we traveled to their house on Saturday. We have been enjoying such beautiful weather around here…it seems so strange to think that a little over a week ago, we were sweating it out in Guangzhou, where it was in the 90s and totally humid. We came home to beautiful fall—the best time of year, to me. The temps are nice during the day and cool at night and we are starting to wear long sleeves! Yay! On Sunday, we went to a larger picnic in the park to meet with my mom’s side of the family. My mom is from Illinois. Each year, her extended family has a large reunion in a park, where families come from miles around to meet together, eat, and reminisce. There are enough families living in Nebraska now that the group is starting a Nebraska-branch annual picnic, so we went and met with several families this weekend. Did I take a single picture? No. Suffice it to say that it went well. I hope we didn’t overwhelm Jia Qing with everyone…it’s hard not to when there are so many people. I am loving being home. We are getting ready for our first full winter here on the homestead and trying to get things wrapped up, both indoors and outdoors. We also bought Halloween costumes already, rather than waiting until the last minute, as we did last year. The boys’ theme this year is Star Wars. I’m sure we’ll get more pictures coming up of them in their costumes for Halloween, but they wanted to try them on yesterday to wear while cleaning their room. Hey, whatever works to get them to do some housekeeping, right? Oh, how we are glad to be home. It was a very long trip, but we made it! Russ and I took a lot of time in Guangzhou to pack everything up—which was no small feat with the six of us—and we headed out early in the morning to take a van to Hong Kong, which took about three hours. We then flew from HK to Chicago, which took 14 hours. The kids were very happy because each seat had a TV screen with choice of movies and games. Ellie watched a Tinkerbell movie three times and was thrilled. All of the kids slept on the way home, but Russ and I were not able to fall asleep, so we were barely staying awake on the second flight between Chicago and Lincoln. The jet lag is evil, but it seems to be going away now. Thanks to melatonin supplements, we haven’t done too badly sleeping at night, except for Asher, who somehow seems to have some trouble. Maybe tonight he will sleep right through. I keep hoping. Jia Qing was very excited to come home and my mom graciously bought us some groceries and a gift for him so they were there when we arrived. I think he was a bit overwhelmed at first because there was a lot to see. When he is nervous or overstimulated, he sort of flits from one thing to the next. I can’t blame him…there was a house, a different bed, all new toys (to him), food, everything. It will take some getting used to. After a couple of days, we started back at school. I had talked with Jia about how we go to school at home. I’m not having him do a lot of work right away, though or going through English study right off the bat. We look at some books and he does some of the same things as the other kids as far as drawing, coloring, or crafts, but otherwise, I’m taking it slow with him. I may change that, though, sooner than I thought. Caleb finished some work yesterday where he was practicing double-digit subtraction and Jia Qing asked me why he wasn’t doing that, too. Hmm…so you’re telling me you want to do math! So, today, I had him try some subtraction, too, and he did great! We’ll still take it slow these first few weeks and focus more on keeping things together as a family and bonding, rather than pushing through with work. Still, everyone is adjusting very well. I went to the store a couple of days ago—by myself!—and was remembering a night from about a year and a half ago, when we were still living in the apartment. The thought of adopting another child was so not on my radar, in part because we were living in a small space and I felt like we had our hands way too full already. Of course, I also was not imagining adopting an 8 year old. Each day since we have met Jia Qing, I am thankful to the Lord that we did. He is amazing. He is so joyful and sweet. He gets mad, like everyone else, but he also has such a kind and happy temperament. I think of how he spent eight years in an orphanage/foster care situation and I’m so thankful that he has something permanent now. I see it in these little things, everywhere. Last night, I was cutting apples and he and Caleb kept coming into the kitchen to sneak pieces of them. We are starting to clear space in the yard to plant more grass and he was right there with everyone, moving things around in the yard. We were listening to music while the boys were cleaning their room and he was singing some of the songs later, after hearing them (I think) only once. So much a boy, a son who lives here. As we go into these next few weeks and months of adjustment, I know we will have trials and difficult times. That is part of this whole deal. But I’m also aware that every day now is different than it used to be, in a good way. Compared to that time when I wasn’t considering adopting again, life has changed so much. It goes in fast forward, sometimes it is challenging, but in the end, it is all worth it. We have had such busy days while here in Guangzhou. It almost doesn’t seem possible that we will be going home tomorrow, but it is! I’m so grateful for the time that we have had here in China, the people that we have met along the way, and of course, for our new son, Jia Qing. I wanted to share something today that has been on my mind and that I keep seeing again and again here with many of the families we are traveling with, and that is about the hosting program. I do not believe that we would be here today if it were not for Jia being hosted in the United States last winter and having that experience. When we first learned about Jia Qing, one of the things that we read about him was that he was hosted in the United States during the winter of 2014-2015. 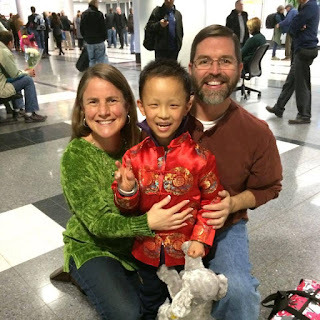 We were actually a bit shocked that, at 7 years old, he flew to the U.S. to meet a family and stay with them for a month. We thought he seemed so young. 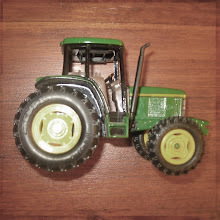 We assumed that it would be too difficult for everyone involved, both him and the family. We presumed that it would be confusing for him. We were wrong. My only experience with hosting was when I was in high school and we hosted exchange students from Denmark and from Germany. Later, my sister Marna went to Denmark as part of student exchange as well and lived there for a year. These situations were all involving teenage students who had families, not orphans who seemed to be between the ages of 7 and 13. So, we didn’t really understand much about how hosting orphans from China or any other country worked. 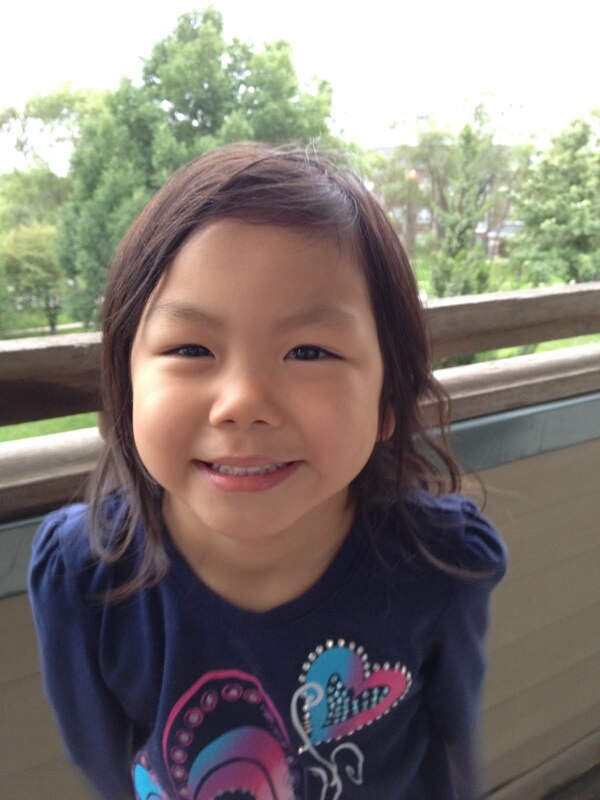 At one point when we were considering Jia’s file for adoption, I remembered that, a few years ago, I had read that a group from Love Without Boundaries had gone into an orphanage in China and had taken the kids out for the day to go swimming and go out to eat at a restaurant. When they went back at the end of the day, they received pencils and new pairs of shoes and the kids were so delighted and happy over those simple things. The things we think nothing about, like eating at McDonald’s or driving in a car to stop at the store, those things that are even mundane to us, were exciting and adventurous to these kids because they had not had these experiences. Even though they had to return to the orphanage at the end of the day, they still received that valuable time of visiting somewhere else and taking home a small token of something just for them. And that is the way hosting is, yet on a much larger scale. Think about a child who is an orphan and who is 7 or 8 or even 11 or 12 years old and who has not had a family. Many people want to adopt very young children, which is wonderful that there are homes for babies and toddlers so that they do not grow up in orphanages. But when a child in the system gets to be older, his chances of being adopted grow slimmer. It’s a very sad reality, but it is true. In China, children are no longer eligible to be adopted once they turn 14. At the very least, hosting allows an older child a chance to experience a family. I say “at the very least” as if it were a small thing and it is not. It is huge. A chance to live as part of a family, with brothers and sisters, sitting together for meals to eat, going places and riding in the car, doing all of the things that we live with every day that these children never experience, is huge. They get to be a part of something so much bigger than they have ever known. They get to experience something that means so much that we often take for granted. They get family, and even if it is temporary, it is still a time for them to have friendship, bonding, and love from others. 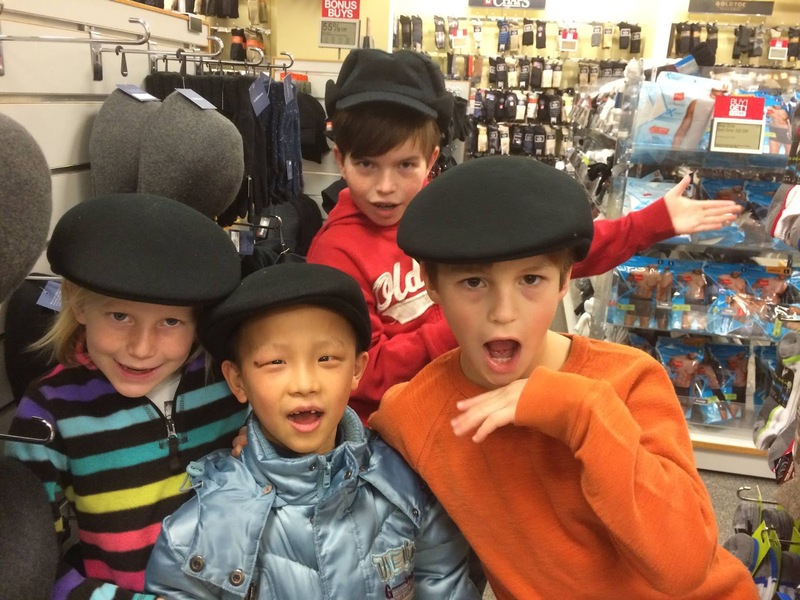 Once hosted, the kids return to their orphanages, but it often doesn’t end there. Many of them go on to be adopted, whether by the families who hosted them or through the family’s advocacy. 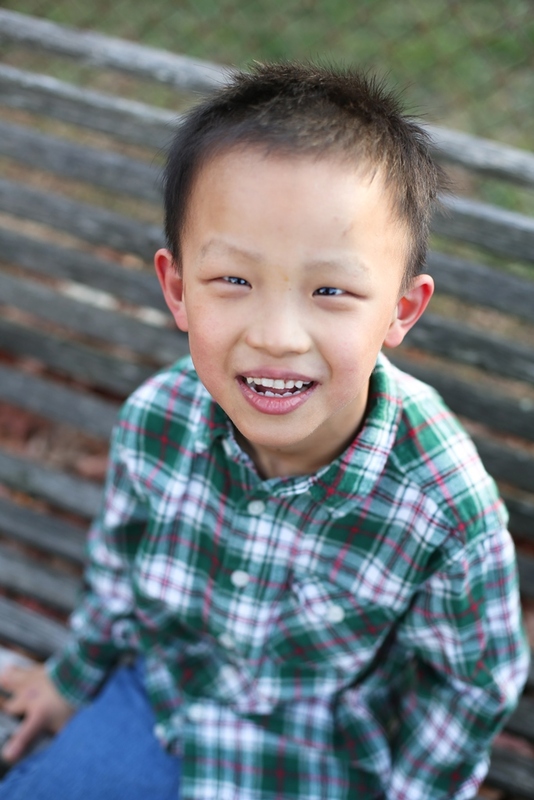 In Jia’s case, his family tirelessly advocated for him to find a family, telling of how sweet and kind he is. If it were not for them, we would not be here with him. That is the truth. We owe so much to that family that we could never repay. Jia has a naturally sweet and kind personality, but I have also seen him be very polite, gracious, and well mannered because of what he learned when he was hosted. I also think that he is adjusting very well to having siblings and parents in large part because of his time when he lived in the U.S.
We have met many people on this trip who met their child through a hosting program. We cannot underestimate the effects of this process. Hosting an orphan is life changing. It builds families. It connects people. It makes a huge difference. We arrived in Guangzhou Saturday evening after several hours of travel. Guangzhou (pronounced gwahng-joe) is in the southernmost province of China, while Shenyang is in the north. Sort of similar to flying from New Hampshire to Florida in the states. The weather is different, too, obviously. It is very hot and humid here and there are 19 million people living in this city. It's big. We checked into our hotel, which is very nice. There is a McDonald's across the parking lot and a Starbucks just off the lobby. This probably makes me sound like I eat at these places all the time at home, which I do not! It's just that after a week and a half of dim sum and Chinese food, it is nice to have something familiar. We love Chinese food, but we do not want to eat it for every meal. It is sometimes nice to have, say, pancakes for breakfast instead of fried noodles or pork dumplings. The first day here, we visited a few touristy sites, which was very interesting. The first place was the Banyan temple, named for the Banyan trees growing there. There were a number of statues and people burning incense and leaving gifts on the altars. Caleb had a lot of questions for me: Where are the statues of Jesus? (they are not here, this is a different type of temple). Why are they leaving gifts? (Because they believe it will please their gods.) Can we take the gifts? (No.) Why don't they believe in Jesus? (..... I don't know, son.) That probably makes me sound inept at explaining religious diversity to my child, but it was difficult. Caleb has always been very pro-Jesus, if you will. 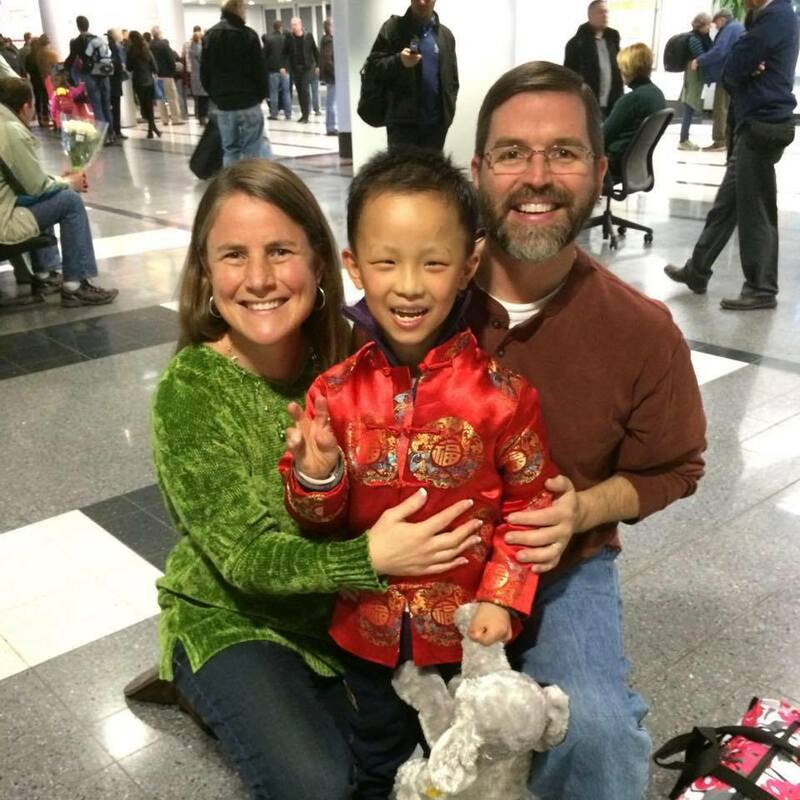 He has a lot of concern that people do not know about Him and has talked in the past about moving to China to be a missionary. Our wonderful, sweet-hearted son. We also visited the Old Chen house, which is an enormous home built for one of the oldest and wealthiest families in China. It was really amazing, but of course, not anything like a mansion that we would think of in the United States. It is more indoor/outdoor rooms with incredible carvings, both on the exterior of the home and on the relics inside. They have ivory carvings, sometimes with the tusk shape still intact, they they create the most intricate scenes of ships and houses out of. I can't really capture how cool it really was. Temperature wise, cool was not the word at all. It was actually quite hot. And steamy. This made for some cranky kids, so I'm thankful we got these pictures at all, with one or two smiling people. We also saw our guide from three years ago when we adopted Ellie. His name is Jason and he works for our agency, we were just assigned different guides this time. But we all recognized each other and got a picture with him. The guides here in Guangzhou are simply wonderful. They are so very helpful and kind toward us. Monday was Asher's official birthday. 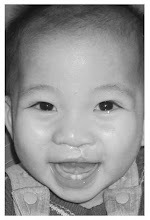 He is seen here (wearing my glasses) proudly displaying his first lost tooth, which came out in Beijing. Interestingly, the tooth fairy visits Beijing as well and leaves Chinese yuan instead of American dollars. On his birthday, the guides sang to him "Happy Birthday" in Chinese and everyone in the group tried to join in. He was happy and smiling in that, "aw, shucks," head tucking, shy sort of way of his. We were able to get a cake from the bakery here in the hotel, which was more of a very large, rich brownie. They gave us candles and we sang to him ourselves in the room later in the evening. We are having a good time, but we are ready to come home. I keep thinking that it is Jia's home, too, but he is in between right now. Although we will be happy to fly home, he is leaving his home country. I know the other kids have adjusted and he will, too, but I want to recognize how difficult it may be for him. We are blessed with so much and he has so much to gain, but change is also hard. Still, it will be good to be home. We are waiting on our consulate appointment, which is tomorrow. Then, we have to wait another day before we can actually leave the country, although I'm not sure why that is a rule. We just follow. So, we leave on Friday to fly home. Three more days of this fascinating country and we will be boarding that plane, homebound. Today, we leave for Guangzhou for the next leg of this trip. Oh boy...we'll see how this turns out! I think that the kids have been a little stir crazy for the past couple of days. We go out every day and go places and keep busy but when it comes down to it, they are tired of being in a hotel room. Duly noted. There's just nothing we can do about that right now. Still, we will fly to Guangzhou for several days and then we will be on our way home! I should mention one thing that I haven't talked about much, and that is what we call Jia Qing. I mean, we refer to him as JQ or Jia Qing and we also call him that, but I've had several people ask what his American name will be. All of our other kids were given American names and we started calling them that relatively early on, sort of transitioning them into it. 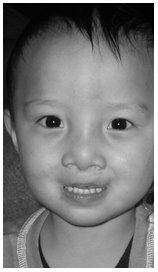 For instance, although Caleb was referred to as "Wu" for a year while we waited for him, his caregivers here were calling him Tian Tian. So that is what we called him for a while after his adoption, then Caleb Tian, then just Caleb. With Jia Qing, it is different. 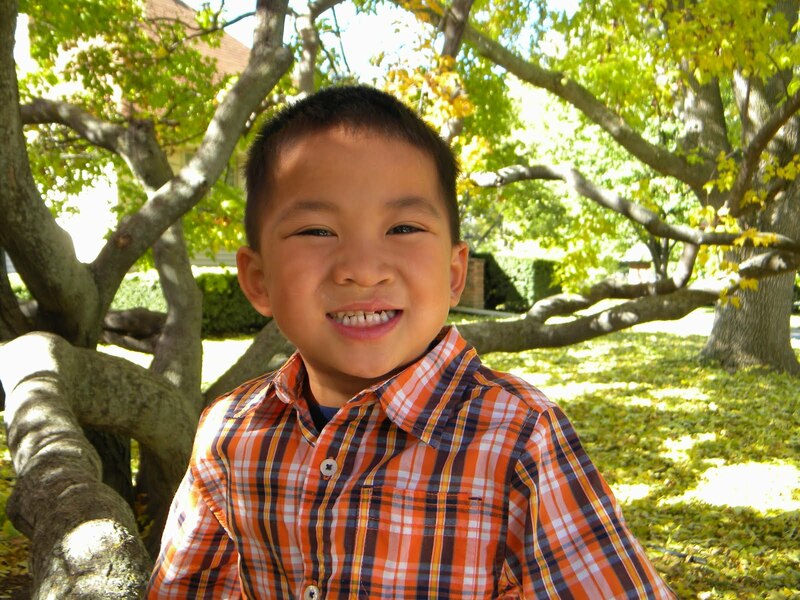 At eight years old, he has so much more of an opinion about such things (not that toddlers do not have an opinion, we know), but also because of Jia's age and experience, we wanted him to know that we have given him an American name, but he can decide how he wants to be called. His American name is Luke. I told him this, and he said he liked it. At first, he wanted to go by that, but then he quickly changed his mind. No, he said, then pointed to himself. Jia Qing. We went through this again with Google translate (which I can only hope got the point across), but he wants to be called Jia Qing. So that's that. And it's great, because, well, that is his name anyway, right? We actually left it as his middle name on his paperwork: Luke JiaQing. It doesn't matter in the way that we have to be picky and make sure that he becomes "American" by choosing a different name. We do not feel that way. But it does matter in the way that he is comfortable with who he is and what he wants to be called. He is otherwise leaving so much behind...his language and his culture and most things familiar to him. On the outside, he is very happy and excited. He runs around with the other kids and shows us things and points stuff out to us. I just want to make sure that on the inside, his sweet heart doesn't break by giving up all of the familiar all at once. When we leave to come home to the U.S., it will be for good. We may come back to China again for a visit, but he will not live here again. And so, I am thinking about this as we move on the Guangzhou today. We will still be in China, but it is the next leg of the trip that finalizes his paperwork at the consulate before we go home. To us, we will be glad to be home but to Jia Qing, it will be the start of everything brand new. It is a tough transition, and one we have not experienced before. Hopefully, with a little time and a lot of grace we will get through this. I'm going to add a few more pictures of our week, since it has been busy! We have enjoyed exploring this city and looking around at the people and the interesting things to see. We went to an indoor play center a couple of days ago and everyone loved it (clarification: every child loved it). We were all very tired by day's end. As we keep moving forward into the next phase, we are sure to see more sights and have even more interesting experiences. I'm so glad that we are all here together! Eating lemons straight out of the cup!